A lot of medical devices involve jet flows, like insufficient valve closing, paravalvular or paraprosthetic leakage flows, cannula outflow etc. The simulation of such flows characterized by rather low Reynolds numbers (between 800 and 10.000) and a laminar-to-turbulent transition is challenging, if high accuracy within a reasonable computation time is desired. Therefore, several approaches to model turbulence were evaluated and the calculated flow fields were validated in detail against Particle Image Velocimetry (PIV) measurements. A Direct Numerical Simulation (DNS), where no turbulence model is used and all the spatial and temporal scales of the flow have to be resolved, would result in a prohibitively high computational effort. In Reynolds-averaged Navier-Stokes equations (RANS), on the other hand, all of the unsteady fluctuations are averaged out and all the turbulent scales are modelled rather than being resolved. This requires a numerical effort much less demanding than DNS, but at the price of accuracy. For all turbulence models tested (k-omega, k-epsilon, shear stress transport), we observed a very weak sensitivity to perturbations of the flow what resulted in qualitatively unphysical solutions (Fig. 1, top). Due to the transitional nature of the flow and the rather low Reynolds numbers, these models are not appropriate when a highly accurate spatial and temporal representation of the turbulent structures is required. The Large-Eddy Simulation (LES), which lies between DNS and RANS concerning both accuracy and computation time, resolves the large, anisotropic and therefore most important scales of the turbulence, whereas the effect of the small, nearly isotropic scales is accounted by using a so-called subgrid-scale (SGS) model . The conventional Smagorinsky SGS model depends on a model parameter which has to be chosen a priori and very sensitively influences the effect of the turbulence modeling. Because of the laminar to turbulent transition and great variations of turbulent scales, no appropriate parameter could be specified (Fig. 1, middle). Therefore, a localized dynamic SSG-model based on results from Germano et al. and Lilly was used (Fig. 1, bottom). This model calculates the proper parameter locally in each time-step based on information contained in the instantaneously resolved scales. For the validation of the numerical model, a special flow chamber for a circulatory flow loop was developed (Fig. 2, top right). Localiced dynamic LES simulations were conducted using the same geometry and boundary conditions (Fig. 2, top left). Instantaneous velocity fields of the simulation and experiment were compared in one plane for three different orifice shapes (round, rectangular, star shaped; Fig. 2, bottom). Length and width of the core jet are in good agreement. Differences of the instantaneous peak velocities of the jet in the measurement plane between CFD and PIV are within ±5% for each orifice. Additonally, time-averaged velocity fields of PIV and CFD were compared to validate the mean flow characteristics (not shown). Length, width and velocity pattern match closely with each other. 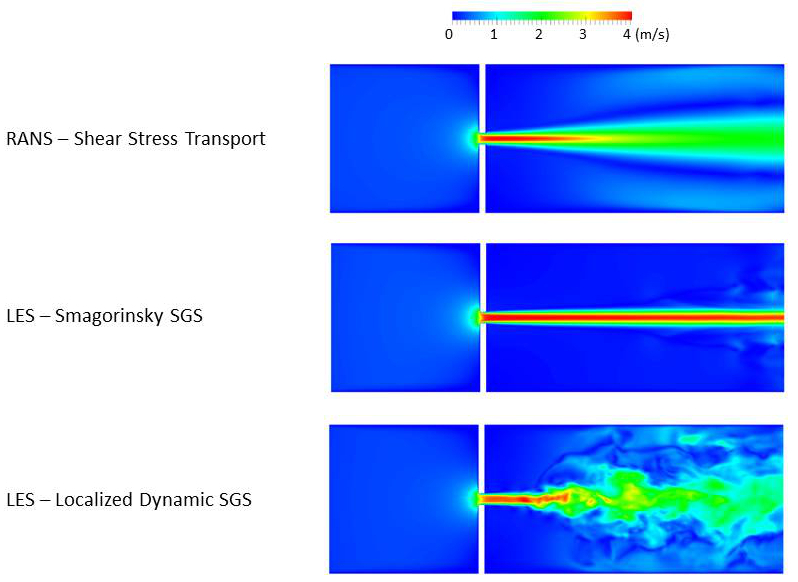 In conclusion, the localized dynamic LES was capable to resolve all instantaneous and mean flow characteristics and predict the transition to turbulence accurately within reasonable computation time. Fig. 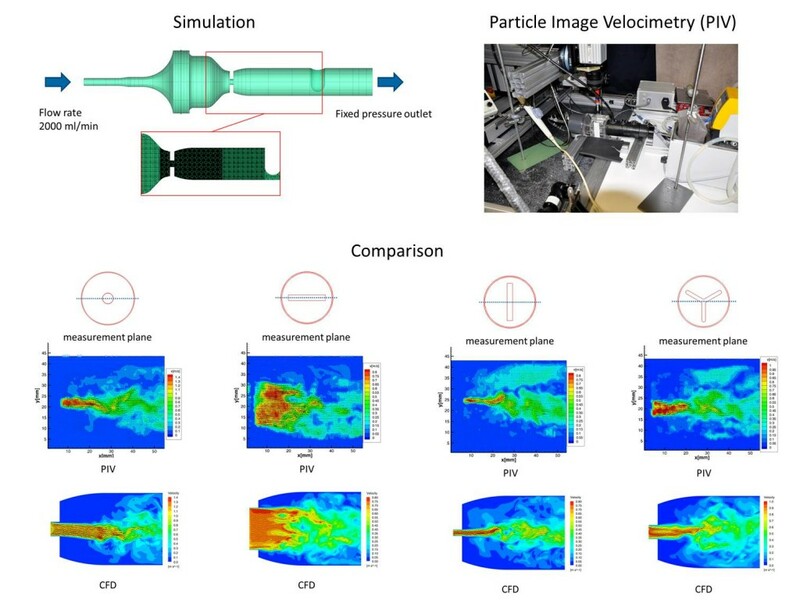 2: (top left) CAD model (circular orifice), boundary conditions and used mesh of the CFD simulation; (top right) Setup of the PIV experiment; (bottom) Comparison of instantaneous CFD and PIV data for the round, rectangular and star shaped orifice. Sonntag SJ, Li W, Kaestner W, Becker M, Büsen MR, Marx N, Merhof D, Steinseifer U. Combined Computational and Experimental Approach to Improve the Assessment of Mitral Regurgitation by Echocardiography. Ann. Biomed. Eng. 2014.